I plead guilty to nostalgia in this image, though I also saw it as an exercise in framing (and a slight hint of homage to one of the truly great photographers whose work I admire.) It should really not be seen in isolation but as a part of my wider work on this area around Borough Market and the nearby wharves, some of which I posted here earlier. 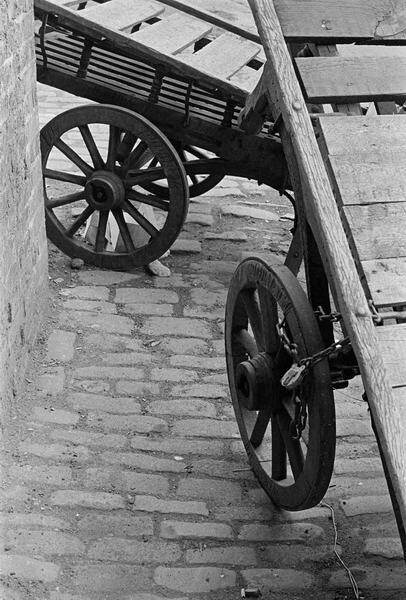 Hand carts such as these barrows were of course much more common when I was young, and many trades made use of them, including as I’ve mentioned before, jobbing tradesmen like my father who used one to carry his tools, ladders and materials. 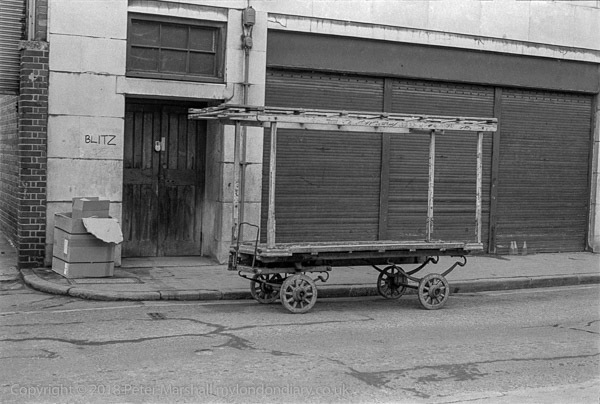 My paternal grandfather had owned several small and not very profitable businesses and I suspect the hand cart that my father used was one that he had made himself in his younger days. Dad’s large work shed, inherited from his father, was a real museum, and still had all the tools needed to build some quite fancy horse-drawn vehicles, including a small bellows furnace with a large drum of coke which was used to heat the iron rims to put on wheels such as this, and once or twice when very young I was employed as an unpaid bellows boy. Next door in a smaller shed was a treadle-powered wood-working lathe which we often used to play with when small, though fortunately we were never allowed to play with the band saw, a large and rather fiendish device and I made to adulthood with a full set of limbs. My father also worked in his youth for other companies, including Dennis, where he built wooden fire engines before they decided metal was a better idea. For more complex iron work, a few streets away was the ‘power forge’, owned when I was small by my father’s brother, with much belt-driven machinery and a steam hammer, but at its centre a coke fire with an electrically driven air supply on which metal ingots would be heated to the required colour before being removed with long tongs and hammered on an anvil before being worked on the other machines. 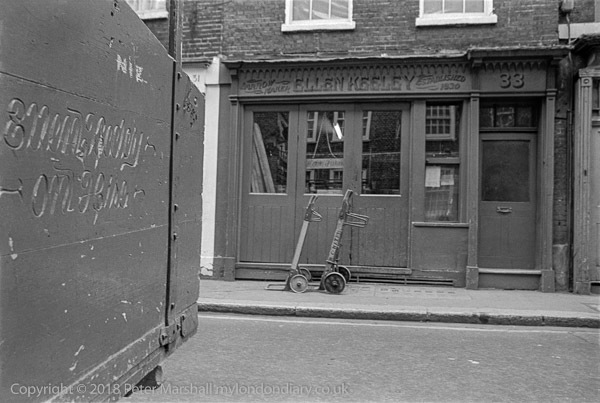 The market at Covent Garden closed in November 1974 and moved to Nine Elms, but there were still some traces in the area. The Cross Keys is still there, a small pub with an extravagant facade, built with the rest of Endell St in the 1848-9 and Grade II listed. As well as the two cherubs holding St Peter’s Keys who I rudely cut off at the top of the frame, the interior walls are incredibly cluttered, thanks to the owner being addicted to the collection of largely Victorian bric-a-brac, abetted until recently by the presence of Bonhams nearby. It’s also now soemtimes hard to see the pub through a collection of hanging baskets, tubs, shrubs and flowers, which together with the putti and keys make it one of London’s most photographed facades by tourists. Better news is that it is now no longer a Watney’s pub. 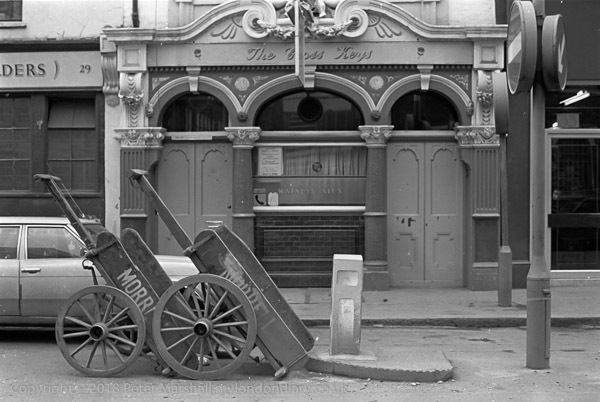 The barrows outside when I photographed them were I suspect kept there by the landlord to add a little character. More recently the whole area is paved and there are a couple of large barrels, and in summer at least outside seating for the pub. 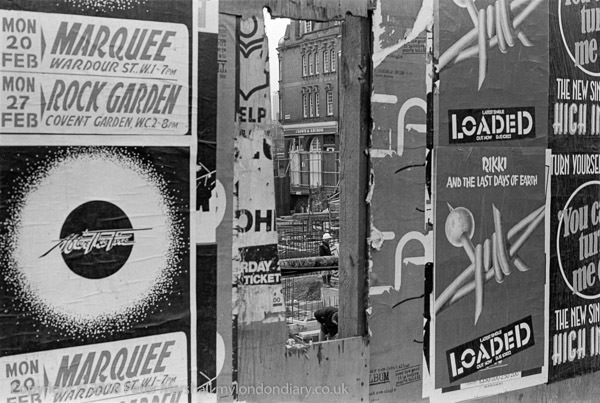 The fences around building sites were seldom officially decorated back in the seventies, but those in areas like Covent Garden soon attracted extensive flyposting for events and record releases. Across the building site here is the Shelton St frontage of the Crown and Anchor pub in Neal St, and I think this picture and that below were probably taken in Endell St. 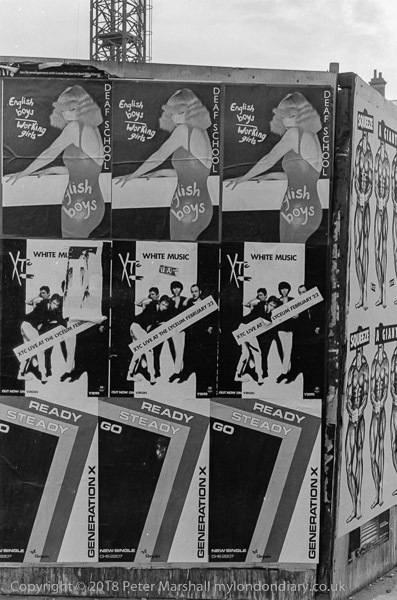 Blitz was a weekly club-night in Covent Garden, London in 1979-80, much frequented by art students, where the New Romantic subcultural movement is said to have begun. People would spend the week preparing their outfits for it hoping they would look interesting enough to pass Steve Strange on the door, who famously turned away Mick Jagger. I’m not sure where this was taken, but Blitz was certainly not far away. The text on the wall lacks much artistry, but the four-wheeled barrow in front of it was one which could be used to wheel goods into a market pitch and sell from. 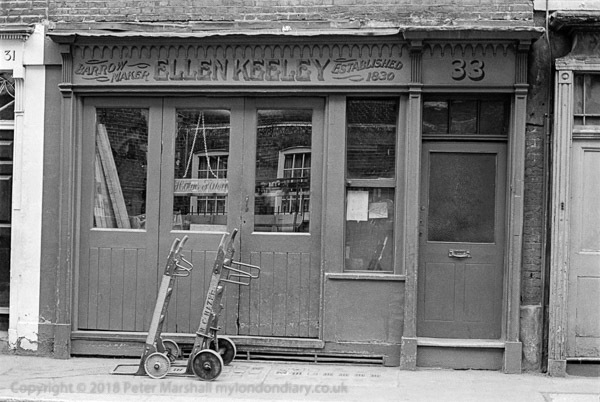 Ellen Keeley’s shop at 33 Neal St, opened in 1900 closed around 1982. The Keeley family came from Ireland at the time of the potato famine in 1830 and began business in London then. James Keeley is said to have invented the costermonger’s barrow and the company also made donkey barrows as well as simple wheelbarrows like those in the photograph. Often barrows were hired rather than sold, and the company Keeley Hire now hires these and many other things to film and TV companies. This entry was posted on Monday, September 3rd, 2018 at 09:00 am and is filed under LondonPhotos, My Own Work. You can follow any responses to this entry through the RSS 2.0 feed. You can leave a response, or trackback from your own site.